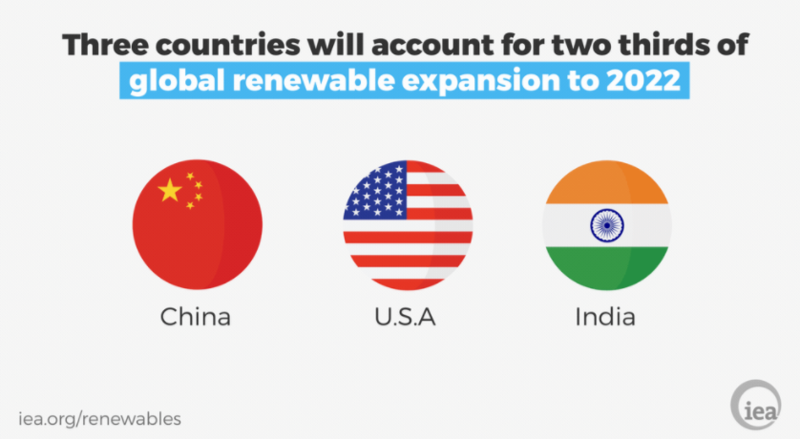 China, India and the US will contribute two-thirds of clean-energy expansion by 2022. Renewable energy production surged in 2016, with around two-thirds – or 165 gigawatts – of net new capacity coming from clean sources. This was thanks largely to booming solar-panel deployment in China and throughout the world, which grew by 50% to around 74 gigawatts. Green energy accounted for almost two-thirds of new power in 2016. That is according to the International Energy Agency’s (IEA) Renewables 2017 report, which says sharp cost reductions and improved policy support are paving the way for continued growth in the renewables sector. The report says record performance in 2016 “forms the bedrock” of the IEA’s electricity forecast, which predicts renewable energy capacity will expand by 43% – or more than 920 gigawatts – by 2022. It adds that solar will continue to dominate the renewables market, generating far more electricity in the next four years than wind and hydropower, for example. Among the top three nations, China is the undisputed renewable growth leader, accounting for over 40% of the total global clean energy mix by 2022. This is due to meeting various capacity targets and addressing concerns about the country’s air pollution. In recent months, for example, China has deployed a number of novel technologies designed to clean the air, including a 100-metre-tall smog-sucking tower in the city of Xian. China has also already surpassed its 2020 solar panel target, and the IEA says it expects the country to exceed its wind target in 2019. China is also the global market leader in hydropower, bioenergy for electricity and heat, and electric vehicles. Perhaps surprisingly, the United States is the second-largest growth market for renewables. Despite President Donald Trump’s decision to pull out of the Paris Agreement, renewable projects in the US are expected to benefit from multi-year federal tax incentives and state-level policies for distributed solar panels in the coming years. However, the report warns of uncertainties around proposed tax reforms, international trade, and energy policies, which could hinder renewables growth in the US. In India, meanwhile, renewable capacity is expected to more than double by 2022. Solar and wind represent 90% of India’s capacity growth, which is the result of auctions for contracts to develop power-generation capacity that have yielded some of the world’s lowest prices for both technologies, the report says. It adds that India has also improved grid integration and addressed the financial issues of its utilities. Because of these factors, India’s growth between now and 2022 is, for the first time, expected to be higher than in the European Union (EU). Incidentally, renewables growth across the EU is 40% lower than between 2011 and 2016, with the market hampered by weaker electricity demand, overcapacity, and a lack of clarity on the capacity volumes that will be auctioned. What’s more, policy uncertainty within the bloc beyond 2020 remains high. However, the report says if the new EU Renewable Energy Directive covering the post-2020 period is adopted, it would address this challenge by requiring a three-year period for policies to support renewable energy, thereby improving the market’s predictability. Fortunately, if you look at individual EU member states, the outlook seems brighter. Denmark, for example, is expected to generate 69% of its energy from renewable sources by 2022, making it the world leader. Ireland is second, with the report predicting it will generate one-third of its energy needs from renewable sources. In other European countries, including Spain, Germany and the United Kingdom, the share of wind and solar will exceed 25% of total generation, the report estimates. The report also monitors off-grid solar applications across developing nations in Asia and sub-Saharan Africa. Over the next four years, off-grid energy in these regions is expected to triple, reaching over 3,000 megawatts. Much of this growth will come from industrial applications, mini-grids, and solar home systems (SHS) driven by government electrification programmes and private sector investments. For example, such is the growth across the SHS market, the technology is forecast to bring basic electricity services to almost 70 million more people in Asia and sub Saharan Africa by 2022, the report says.